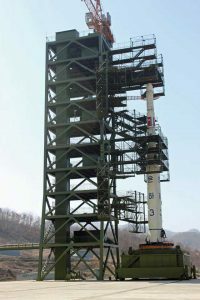 The significance of North Korea's recent launch of a rocket to send a satellite into orbit: testing its ICBM capability. On Sunday February 07, 2016, North Korea sent its satellite Kwangmyongsong-4 into orbit, ostensibly for “science, technology, economy and defense” research purposes. Experts and the international community are concerned however, that the ultimate purpose of this mission was to test North Korea’s Intercontinental Ballistic Missile (ICBM) capabilities, which pose a serious threat to regional and global security and stability. Experts believe that the missile has the range up to 13,000 kilometers. The launch of this rocket comes a few short weeks after the North’s ‘nuclear test’, which was also in violation of the current sanctions on the Democratic People’s Republic of Korea (DPRK). Before this latest, North Korea did notify the United Nations of its plans to send an earth observation satellite into space. The country’s National Aerospace Development Administration even called the launch “an epochal event in developing the country’s science, technology, economy and defense capability by legitimately exercising the right to use space for independent and peaceful purposes”. In the immediate aftermath of this incident, reactions from the international community were numerous and varied. The United Nations Security Council (UNSC) called an emergency meeting strongly condemning the action and resolving to adopt additional sanctions in response. UN Secretary-General Ban Ki-moon further urged North Korea to “halt its provocative actions”, while the US ambassador to the UN, Samantha Power, said the UN would “come up with something tough”, as “there can be no business as usual”. The Japanese envoy said that since current sanctions could not halt North Korea from developing nuclear arsenals and long range missiles, the new sanction must be tighter. The Chinese ambassador to UN said the purpose of the new sanctions should be “reducing tension, working toward de-nuclearization, of maintaining peace and stability, and of encouraging a negotiated solution.” Russia, the other significant member of the UNSC, emphasized on “reasonable solution” of the issue which may not produce an economic crumble in North Korea or increase current tensions, and emphasized on ‘six-part’ talks on the issue. To date, the UNSC has imposed four sets of sanctions on North Korea since its first nuclear test in 2006. These mainly included arms embargos, asset freezes, travel bans and restrictions on luxury goods, with the aim of targeting the lifestyle of the country’s elite, so that they may be inclined to turn away from nuclear and missile programs. However, they have failed to produce these desired results. South Korean intelligence agencies are also claiming that North Korea is also preparing for a fifth nuclear test and already has an ICBM capability. The agencies also said that the most recent launch should be considered as a ballistic missile test. Given the escalating situation in the Korean Peninsula, South Korea and the United States are contemplating deployment of the US advanced missile-defense system ‘Terminal High Altitude Area Defense (THAAD)’ as a countermeasure to North Korea. China and Russia however, are against this as they argue that this system would undermine the strategic stability between China, Russia and USA in the region. Previously, North Korea launched a long range rocket with a communication satellite in 2012. However neither did the satellite send any signals, nor has it been detected as yet. In May 2015, it claimed to have has successfully conducted its first submarine-launched missile (SLBM) test. The veracity of this claim is also still considered dubious. In April 2012, North Korea tested the ‘three stages’ rocket, which however was an acknowledged failure. In 2009 DPRK had also tested the same missile, but the US also contests the success of that attempt, as it does with the 2006 DPRK test of its long range missile Taepodong-2. It is believed that North Korea possesses over 1,000 missiles of various categories, capabilities and range, which can potentially reach US soil. Its missile program began with small artillery rockets in the 1960s and 1970s, which it converted into short and medium range ballistic missiles in the 1980s and 1990s. It is also believe that even greater range missiles are under research and development. North Korea currently possesses a variety of short range missiles, such as KN-02 (160km range), Hwasong-5 (300km) and Hwasong-6 (500km), aimed specifically for reaching anywhere in South Korea. These missiles have ability to deliver conventional, biological, chemical and nuclear warheads. Alongside, DPRK also possesses the Nodong missile, with a range of 1300km that can target Japan. North Korea tested these missiles in 2006, 2009 and 2014. The (untested) Musudan missile ranges between 2500km to 4000km, and can potentially target the Japanese island of Okinawa as well as US bases in the Pacific Ocean. The Taepodong-1 missile is the DPRK’s first multi-stage missile; it is believed that its first stage consists of the Nodong missile, while the second stage consists of the Howdong-6 missile. Its estimated range is between 2200-2900km. Taepodong-1 is what has been used for sending the satellite into orbit. The yet untested Taepodong-2 is a three-stage missile with a 4300km range; the increased power enables it potentially to hit Australia, some parts of the US as well as other regional countries. 1. North Korea’s long-range missile is a direct threat to the US, its territory, strategic forces and military bases in the region. The capability is also a challenge for other nuclear countries. 2. Continuous provocative actions by North Korea are also an indicator that it may take similar confrontational measures against its closer rivals, especially South Korea, Japan, and the US and also provoking to its rival countries. DPRK may also attempt to challenge the security and territorial integrity of its ‘ideologically rival’ countries. 3. North Korea’s actions may in turn compel its rival countries, especially South Korea, Japan and USA, to deploy nuclear weapons for the defense of US allies in the region against any provocative measures by the DPRK. 4. DPRK military initiatives will disturb arms control and disarmament initiatives at regional and global levels among major competitors. Any ‘countermeasure’ taken by USA in the region, in the form of deployment of THAAD or of nuclear weapons, could lead to increased antipathy between China, Russia and the US. These measures would also negatively impact arms control and disarmament initiatives. 5. International security and strategic stability is locked in complex matrix of arms control measures and balance of power. In this context, if even one country – be it USA, Russia or China – triggers an arms race, it would create a catastrophic chain reaction among all nuclear countries, especially the US, China, Russia, DPRK, India, and Pakistan, due to their existent threat perception and security dilemmas. 6. The DPRK’s actions can inappropriately encourage to other NPT member countries to purse nuclear weapons technology. 1. Both sides must refrain from further provocation to try and arrive at a universally acceptable solution. In the current scenario, engagement via dialogue is the best, and perhaps the only option that could lead to the denuclearization of DPRK. The ‘Iran Nuclear Deal’ is a useful prototype for the international community to develop such a roadmap. 2. As China and Russia have closer relations to DPRK, they may act as a bridge between it and the US, South Korea and Japan, potentially reducing tensions, encouraging a negotiated solution and working towards denuclearization of DPRK to restore peace and stability in the region. The ‘Six-party talks’ initiative should therefore be restarted. 3. As during the Iran case, the European Union could also play the role of mediator by inviting both sides to a dialogue for managing the crisis, and insisting on a peaceful resolution. 4. The US should refrain from an over-hasty deployment of the THAAD system or of its nuclear weapons on the territories of its regional allies. Such actions may exacerbate the current ‘standoff’, not only with the DPRK, but also antagonize China and Russia as well, as both are vehemently opposed to the deployment of the THAAD system in the Korean Peninsula. M. Suleman Shahid (@M_S_Shahid) is a Research Associate at the Centre for Pakistan and Gulf Studies (CPGS) (@cpgs_org), Islamabad, Pakistan.